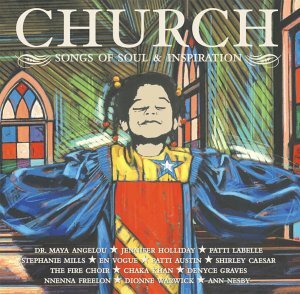 Church: Songs of Soul & Inspiration is a beautiful recording of songs that are drenched in soul, spirit, faith, and a couple of extra cups of love. It opens your heart and fills it with warmth. It takes you to church whether you are sitting on a beach or in rush hour traffic. The inspiration of this music touches you right where you are. The initial seed for this project was planted with mezzo-soprano Denyce Graves when a young fan told her he could hear Church in her voice. She teamed with songwriter/producer Tena Rix Clark to create this magnificient recording. There is also a second CD which includes interviews with each of the performers capturing their early experiences in church and video footage of the recording. The liner notes are beautifully written by Nobel Prize winning author Toni Morrison. On a personal note, I had to get this CD after both my sister-in-law and a close friend were in love with it and told me I definitely needed to give it a listen. I am glad that I did. This entry was posted on Monday, July 14th, 2003 at 7:47 am. It is filed under Music News/Info, Music Reviews and tagged with Ann Nesby, Chaka Khan, Church: Songs of Soul & Inspiration, Denyce Graves, Dionne Warwick, Dr. Maya Angelou, En Vogue, Jennifer Holliday, Nnenna Freelon, Patti LaBelle, Stephanie Mills, Tena Rix Clark, Toni Morrison. You can follow any responses to this entry through the RSS 2.0 feed. I found out of this CD when it was featured on my guilty pleasure daytime show “Good Day Live”, with Miss Patti LaBelle having Jillian Barberie sing with the House of Blue’s Fire Choir. Nonetheless, Chaka Khan’s track caught me out of the blue; it’s a song that’s near and dear to my heart, “Love You Still”.